Noted scholars analyze a variety of creative works—plays by Samuel Beckett, novels by Maxine Hong Kingston, music compositions by Igor Stravinsky, art by Jean-Baptiste-Simeon Chardin, and films by Michael Haneke— to offer a unified knowledge of artistic creativity. Toward a Cognitive Theory of Narrative Acts brings together in one volume cutting-edge research that turns to recent findings in cognitive and neurobiological sciences, psychology, linguistics, philosophy, and evolutionary biology, among other disciplines, to explore and understand more deeply various cultural phenomena, including art, music, literature, and film. The essays fulfilling this task for the general reader as well as the specialist are written by renowned authors H. Porter Abbott, Patrick Colm Hogan, Suzanne Keen, Herbert Lindenberger, Lisa Zunshine, Katja Mellman, Lalita Pandit Hogan, Klarina Priborkin, Javier Gutiérrez-Rexach, Ellen Spolsky, and Richard Walsh. Among the works analyzed are plays by Samuel Beckett, novels by Maxine Hong Kingston, music compositions by Igor Stravinsky, art by Jean-Baptiste-Simeon Chardin, and films by Michael Haneke. Each of the essays shows in a systematic, clear, and precise way how music, art, literature, and film work in and of themselves and also how they are interconnected. Finally, while each of the essays is unique in style and methodological approach, together they show the way toward a unified knowledge of artistic creativity. Frederick Luis Aldama is Arts and Humanities Distinguished Professor of English at Ohio State University. He is the author and editor of nine books, including Postethnic Narrative Criticism; Brown on Brown: Chicano/a Representations of Gender, Sexuality, and Ethnicity ; the MLA-award winning Dancing With Ghosts: A Critical Biography of Arturo Islas ; and Why the Humanities Matters: A Common Sense Approach . In 1959 when C. P. Snow famously declared the need for building bridges between "the two cultures" of the sciences and the humanities in order to make the world a better place, the impulse wasn't so much ahead of the curve, but simply wrong. It wasn't that in 1959 few knew how and where to build such bridges. The separation itself was a line drawn in sand—specious and artificial. To understand why our work in the humanities matters, the scholarship presented in Toward a Cognitive Theory of Narrative Acts shows just how we can wipe out that erstwhile line drawn in the sand that artificially separates the sciences from the humanities; that separates those disciplines deemed empirical and in pursuit of the universal (the "nomological") from those considered speculative (even if analytical) and in pursuit of the idiosyncratic (the singular or "punctual"). Whether we're talking about mathematics, physics, chemistry, and biology or psychology, literature, linguistics, philosophy, history, and classics, knowledge in each discipline advances along a continuum between the hypothetical and the tested and confirmed. The humanities are part and parcel of the knowledge the human species has acquired about itself over the centuries, together with the social sciences and the natural sciences. Knowledge is acquired in many ways and may exhibit many degrees of generality, certitude, and power to predict the future. It can be the product of direct observation and a small number of general assumptions, or the result of a very elaborate and long chain of hypotheses and deductions. It can possess a rich factual content or be almost devoid of it, but it must always lead back to factual observations. Indeed, it is the development of knowledge in the humanities that has allowed many fields to become real scientific disciplines and to become separate scientific endeavors, distinct from the humanities as still embryonic forms of future disciplines. By the end of the Middle Ages and from the Renaissance onward, many fields studied by Aristotle became independent sciences (particularly in the eighteenth and nineteenth centuries). The same thing happened with the domains included in the humanities. The number and the nature (contents) of those domains changed over the centuries and gave birth to new fields of humanities and to the so-called social sciences, along with a certain number of natural sciences. In our many activities we are reshaping the world that exists independent of our creating; in turn, this transformed world shapes us and our subsequent activities. This takes place in a one world—a supersystem composed of interconnected systems of various kinds (physical, cultural, social, biological, and so on) that possess their own peculiar properties and laws. Given that this world is one, as the different tributaries of knowledge gain force and depth, they necessarily move with increasing momentum toward one main stream. In the work of Aristotle, Marx, Einstein, and Chomsky, we see this disciplinary convergence at play. Think of all the fields studied by Aristotle (including the knowledge he himself developed) to understand his one world more completely: from biology (zoology and botany) to medicine and the constitutions of the nation-states in Greece, to law and physics, and, of course, to logic. Chomsky's early and radically innovative formulation of a universal grammar is also a case in point. His research program threw new and important light not only on linguistics, but also on biology (the modularity of the brain), psychology (the mind not as qualia independent of the brain, but as a mind/brain composite), and mathematics (recursive function theory). Today, we see modern linguistics in convergence with other research programs such as those advanced in neuro- and evolutionary biology as well as in zoology (animal communication systems). (See Chomsky et al., "The Faculty of Language: What Is It, Who Has It, and How Did It Evolve?") Today, the human genome mapping not only gives us a much sharper understanding of biology (genetics), but proves instrumental in advancing knowledge in geography, archeology, anthropology, and linguistics, among other areas of inquiry. The scholarship in this collection embodies this impulse toward unification. Each scholar seeks to sidestep subjective opinion and raw speculation in favor of establishing a research program that moves forward through a series of checks and balances (proofs and disproofs) within his or her respective area of scholarly inquiry. While each uses a different theoretical approach, each employs advances in the sciences (especially the biological) to understand better all variety of cultural phenomena that we spin out of ourselves. Opening Part I of the collection, "General and Theoretical Considerations," Herbert Lindenberger's chapter "Arts in the Brain; or, What Might Neuroscience Tell Us?" shows how research in the neurobiological sciences is indispensable to understanding more deeply our creating and engaging with painting, music, and literature. His examples are many. In one instance, he analyzes why Stravinsky's compositions and not those of Schoenberg went from being rejected to being widely accepted; while the brain evinces a remarkable plasticity, no matter the amount of social and cultural educating, it can only accept a limited amount of chaos before it simply turns off. Ellen Spolsky's "Narrative as Nourishment" uses the conceit of metabolism as a way to develop a cannibalistic approach to understanding innovation in narrative fiction. Her "reality-based" approach applies research in the cognitive sciences to deepen our understanding of how authors strategically create gaps in the information they provide about characters, settings, and events that deliberately lead readers to fail in their inference and mind-reading of characters and authors. For Spolsky such narrative fictions lead to a certain hunger in other authors; they "stimulate others to expand the search for the kind of nourishment that could satisfy." In "Narrative Empathy" Suzanne Keen asks that we reconsider just how a narrative fiction allows us to step into the shoes of and feel for a character. This is not a result of narrative technique, but rather the net result of the narrative fiction as a whole created by the author (the blueprint) and the active participation of the reader. Moreover, the author's creating of the narrative fiction (blueprint) and the reader's following of this blueprint—our filling in all the gaps to solidify in the imagination a coherent and whole storyworld—involves centrally our capacity to empathize and to read mental states of characters and how these mental states relate to the world around them. Several chapters take an interdisciplinary turn into areas such as film. In "The Biolinguistic Turn" Javier Gutiérrez-Rexach points out just how unlike the human mind is to machines (computers) in order to advance a biolinguistic film studies theory. Gutiérrez-Rexach builds on the work in modern linguistics that formulates our evolution of a universal grammar and "conceptography" and their accompanying specific competencies to deepen our understanding of how film works at the universal and idiosyncratic level. The two chapters that follow offer contrastive complements to one another. The first, Katja Mellman's "Voice and Perception: An Evolutionary Approach to the Basic Function of Narrative," identifies how our evolved cognitive capacity to extract information maps onto the emergence in literature of two narrative fiction devices: "voice" and "perception." Mellmann provides a nuanced understanding of how these devices work (together and apart) to convey information in literary and filmic narratives. The second, "Dreaming and Narrative Theory" by Richard Walsh, asks that we revise narrative theory categories and distinctions—say, between story (the time of the events as occurring within the storyworld) and discourse (the time and ordering of the narrative telling)—in light of our understanding of how lucid dreaming works. Sequences and themes of fictional narratives like novels share much cognitive ground with those created in lucid dreaming—and the psychological effects produced by both are similar. This has deep implications not only in terms of revising many of the tools identified by narratology, but also in determining that it is the medium of telling (discourse) and not the story that really matters when talking about, for instance, literature-to-film adaptations. Part II of the collection, "A Selection of New Approaches," includes chapters that explore how narrative fictions trigger and even frustrate our Theory of Mind capacity. In "Cross-Cultural Reading; or, Coming to Terms with the Ethnic Mother in Maxine Hong Kingston's The Woman Warrior," Klarina Priborkin teases out the cognitive schemas that prevent real understanding and lead to misreadings of interior states of mind between two generations of Asian American women. That readers also have a Theory of Mind capacity allows Kingston to use certain devices in the creating of her narrative fiction that allow us to step more powerfully into the shoes of her characters. In Chapter Eight, "Theory of Mind and Michael Fried's Absorption and Theatricality: Notes toward Cognitive Historicism," Lisa Zunshine broadens the critical scope of a Theory of Mind approach, considering a number of different cultural phenomena within a historical context: how it plays out in the creative work of eighteenth-century authors, playwrights, and artists who were interested in representing unusual states of mind and a suspension of self-consciousness. In an analysis of Chardin's painting "The Soap Bubble," for instance, Zunshine argues that it draws in its audience because of its depiction of a perceived transparency of mind embodied in its painted figures. In contrast to Priborkin and Zunshine, H. Porter Abbott considers those narrative fictions that engage audiences less through the triggering of our Theory of Mind (our ability to read interior states and intentions from exterior gesture and expression) with characters and their situations and more through the firing up of our puzzle-solving faculty. In "Garden Paths and Ineffable Effects: Abandoning Representation in Literature and Film," Abbott explores a number of resolvable and irresolvable "garden-path" narrative fictions (literature and film) that challenge our cognitive impulse to link mimetically the fictional with the real world. Those that contain too little information (or in the case of Joyce's Finnegans Wake, too much) and too large a gap in their narrative detail resist our meaning-making process, and we shut off. However, authors and directors can find just the right balance between too much and too little, allowing us to parse the information and make meaning, but often in ways that lead us to titillatingly ambiguous results. Considerations of Theory of Mind also play an important role in Patrick Colm Hogan's "Consciousness, Ethics, and Narrative: Reading Literature in an Age of Torture." Here, however, Hogan sets his sights on how appraisal theory, emotion (guilt, for instance), and Theory of Mind work in our conflict (and resolving of conflict) between right and wrong. In a discussion of King Lear, Hogan shows how it is narrative prototypes—and not rules of behavior—that centrally inform our ethical choices. Lalita Pandit Hogan uses appraisal theory to offer a nuanced analysis also of a Shakespeare play. In "Prophesying with Accents Terrible: Emotion and Appraisal in Macbeth," rather than follow a moral-oriented analysis of the play as is the tradition, appraisal theory reveals Macbeth to be a play that evinces a complex variety of emotions in its characters (and audience) that arise out of multiply layered conflicts in realizing goals and ambitions. While each of the scholars included in this collection uses many different tools to analyze an array of cultural objects, they all seek to follow an interdisciplinary research program that formulates hypotheses, tests them, and revises them with the aim of moving toward a unified knowledge. This does not mean, as Lindenberger astutely reminds us, "that science will rob us of our traditional task of conserving the past and placing artworks within an appropriate historical context, or, for that matter, of subjecting them to the interpretation and evaluation that their consumers have long depended upon." Rather, as with other like-minded scholars, we can learn from science, and this may very well affect, as Lindenberger concludes, "the methods that we choose to exercise our interpretive and evaluative skills." Beyond Ohio State University there are scholars such as Robert Storey, Joseph Carroll, Jonathan Gottschall, and Nancy Easterlin, among many others, who have turned to advances in evolutionary biology to explore the repetition and rupture of human behavior as expressed in the arts. Further solidifying the importance of art and music in our everyday activities, Steven Mithen (Singing Neanderthals) turns to research in archeology and evolutionary biology. Advances in brain science research allow neuroscientist Isabelle Peretz to mine the field of musicology (The Cognitive Neuroscience of Music) to understand the differences and similarities in how we process music and language. In film and drama studies, scholars such as Greg Smith (Film Structure and the Emotion System), Per Persson (Understanding Cinema), Bruce McConachie, and F. Elizabeth Hart (see their co-edited Performance and Cognition) turn to advances in cognitive psychology and cognitive linguistics to understand better how movie directors and dramatists employ and re-deploy certain cognitive and emotive mechanisms and processes to innovatively engage the minds of audiences across time and space. Others have used new technologies such as fMRI, EEG imaging, and PET scans to compare networks of neural response in fiction and non-fiction activities (see Paul Mathews and Jeffrey McQuain's The Bard on the Brain). John G. Nichols (From Neuron to Brain) and Joseph LeDoux (The Emotional Brain) investigate how the biochemical and biophysical transmission of nerve signals creates in humans a higher-minded self that has evolved the capacity for metarepresentation—a key ingredient in our evolved faculty for communication, including the visual, plastic, and written arts. Michael Gazzaniga explores those neural mechanisms that underlie ethics, empathy, conceptual thinking, and self-awareness that allow us to make and engage with the arts (Human: The Science behind What Makes Us Unique). V. S. Ramachandran's neuroscientific research on perception and the senses generally aims to throw light on aesthetics (A Brief Tour of Human Consciousness). Antonio Damasio's neurobiological studies extend our knowledge concerning the functioning and role of emotions (Looking for Spinoza). And others such as Marc D. Hauser (Moral Minds), as well as Jorge Moll and Joshua Greene along with their respective research teams, explore the neurological basis for ethical behavior and attitudes. In our one world, we all tell stories based on actual or made-up events. Our narrative-making and -engaging capacity is universal. And, while biology constrains what we can do with oral narrative fiction (the limits of our memory, for example), we have developed ways to throw off such restraints in a variety of metarepresentational media, including the form of written narrative fiction. In short stories and novels, for instance, there can be deep temporal layers as well as subtle forms of filtering a story through the perspective of a character, such as the use of free indirect discourse and psychonarratology. The work done in narratology, coupled with research developed in the cognitive sciences and neurobiology, can deepen further the use of specific narrative techniques, as well as shed light more generally on the processes involved in our making and consuming of narrative fictional works. As Lindenberger discusses in Chapter One, the recent discovery of the mirror neuron system—a set of neurons that become active in the brain's superior temporal sulcus and the Broca region (or language center) when we perform and observe an action—reveals more precisely how we produce language, feel empathy, interpret and understand other people's emotional states, and know the difference between fact and fiction. I mentioned already Lindenberger's tempering of the interdisciplinary move in the humanities. Before wrapping up this introduction, let me offer several additional points of caution. The use of science to advance an understanding of how, say, narrative fiction works—or opera, or comic books, or visual arts, and so on—is not an end-all and be-all to productive humanistic inquiry. The turn to advances made in cognitive psychology, evolutionary biology, and the brain sciences generally is not meant to be some sort of life jacket that will save the humanities. To consider it thus necessarily risks confusing and even subordinating the study of music, novels, films, comic books, opera, painting, and the like, with the methods and goals that characterize science. As the work here attests, we are entitled to use any knowledge coming from any discipline that will shed light on our object of study; that line drawn in sand between the humanities and sciences needs smoothing over. Hence we would do well to consider how information in the sciences helps further deepen our knowledge of how, say, music, literature, painting, drama, and so on, work cross-culturally to engage audiences (readers, listeners, viewers). Likewise, it is a good idea to formulate a hypothesis, speculate in as hardy a way as possible without any limitations (no fear of what others think), and develop one's thought as far as possible concerning the notion of, say, music, literature, drama, and the like. For instance, one might speculate or hypothesize that recent studies in neuroscience on the localization within the brain of ethical dilemmas—and solutions to these dilemmas—can deepen a theory of narrative acts, allowing one to propose predictive hypotheses that concern cognitive and emotive capacities shared by all human beings. And, one might turn to advances in neurobiology to see what kinds of explanations there are on our everyday faculty for empathy and Theory of Mind to understand better how this works in narrative fiction. However, it would be a mistake to abandon partially or totally a specific study of empathy or ethics in literature under the pretext that whatever there is to know is to be taken from neurobiology. The humanities are an integral part of the knowledge the human species has acquired about itself over the centuries, together with the social sciences and the natural sciences. And it is important for us to cherish the knowledge we have acquired and to continue developing it, because the practical and theoretical human activity called knowing (learning, experimenting, verifying, and teaching), together with the theoretical and practical human activity called technology and technological invention, are the specifically human activities that allowed us to survive and to radiate across the planet. Knowledge is quite literally essential for our survival. In whatever shape you want to slice global reality (social, natural, and so on), and to whatever degree of certainty that we may possess knowledge at any given moment, such knowledge (however limited and provisional) is a necessary stepping-stone for the acquisition of more precise knowledge today and tomorrow. Some scholars currently worry about the future of the humanities. 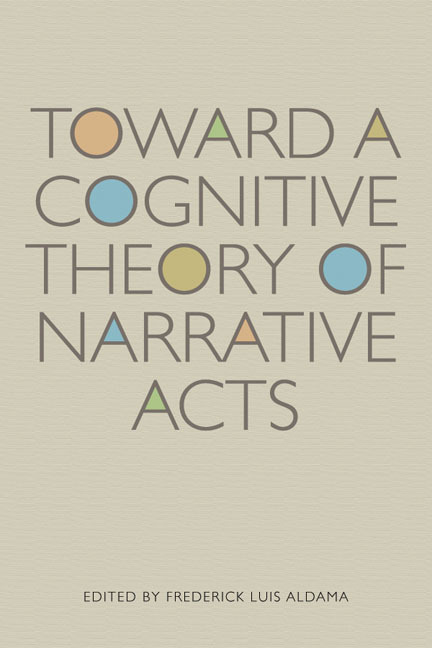 The scholarship presented in Toward a Cognitive Theory of Narrative Acts refuses to worry. To the extent that their contents become more and more precise knowledge, the humanities will give birth to (or transform themselves into) new scientific fields, new sciences, new scientific research programs. Imagine what a science of written narrative fiction will be when we study more deeply phenomena such as free indirect discourse with the help of developmental psychology, neurobiology, and linguistics. The more we learn about certain subjects and problems (techniques such as free indirect discourse, for instance), the more this work will become a solidly established discipline with its own set of problems studied, understood, and subsumed under a series of scientific research programs, approaches, and methods. So rather than bemoan our own obsolescence as scholars in the humanities, as the scholars presented here attest, we would do better to focus our energies in developing concepts as tools sufficiently clear with sufficiently precise boundaries for us to dig for answers to our different sets of questions and problems. The research presented by the scholars in this volume considers the ways in which our work in the humanities to know our world better converges especially with the research programs in the neuro- and cognitive sciences, ethics, biology, psychology, philosophy, and linguistics, among others. Each of the scholars represented in these pages knows well that any individual phenomenon studied requires a cognitive methodology of its own; we will not be able to study John Cage's music with the cognitive methodology of, say, particle physics. While each one requires its own tools of study, each of the scholars presents a "research program" that moves toward a knowledge of the whole—a unified theory. In each of the chapters, then, what we see is scholarship that seeks the means to make its approach more systematic, clear, and precise, so that we can all see with better clarity how music, art, literature, film, and so on, work in and of themselves, and also how they are interconnected. Hence in each we see the identification of a method and taxonomy specific to the particular phenomenon (art, literature, and so on) as well as a reach toward an understanding of those universals that connect these particulars with the whole. Given that the world is made up of "interconnected systems" (25), as Mario Bunge aptly identifies, the scholars here follow methodologies that aim to deepen our knowledge of emergence and convergence of knowledge. Toward a Cognitive Theory of Narrative Acts reminds us that the real, deep reason that our work in the humanities matters, yesterday, today, and tomorrow, is that it is knowledge.